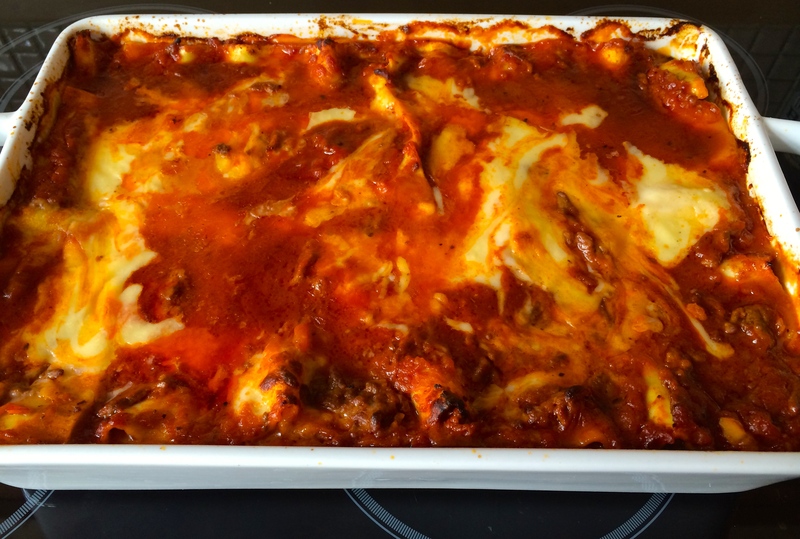 This is the Italian Sunday dish, the celebration dish, the dinner party dish, the dish that will feed up to 10 people in one go, the dish that all Italian Mums make with or without a reason, the dish you can make the day before and still tastes delicious the next day, hot or cold. Right! and this is my very dish, recreated with the ingredients that you can find in any English supermarket. 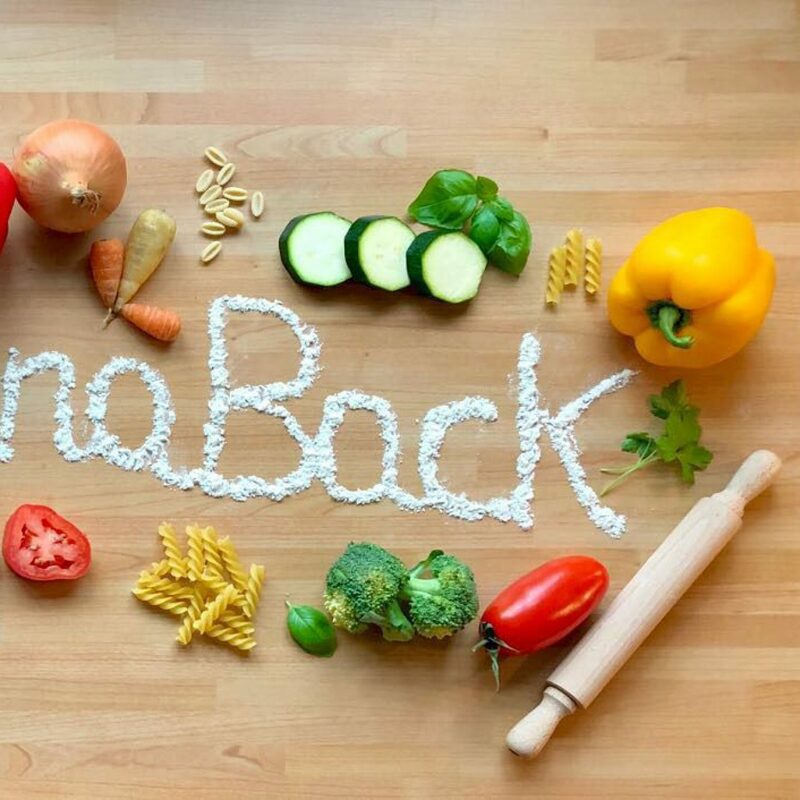 It is important for me to keep my Italian origins whilst I am cooking and using Italian produce is essential. However I found that sometimes we can swap parmesan cheese (quite dear) for cheddar cheese and have almost the same result……….I said “almost” as, if my Nonna knew I am using cheddar instead of parmesan, she would not be very impressed!!!!! but Hey ! sometimes it’s ok to make exceptions, isn’t it? 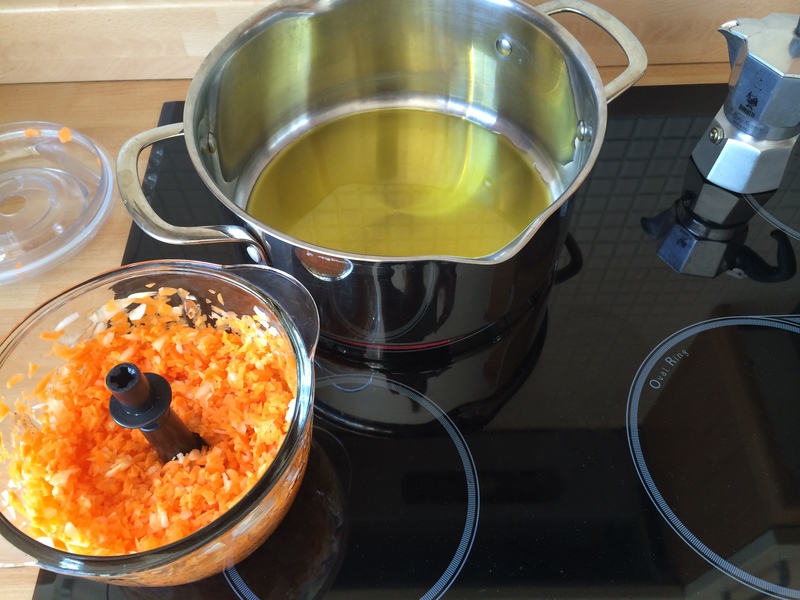 Blend the carrots, celery, onion and garlic. In a saucepan, heat the olive oil over a medium heat. 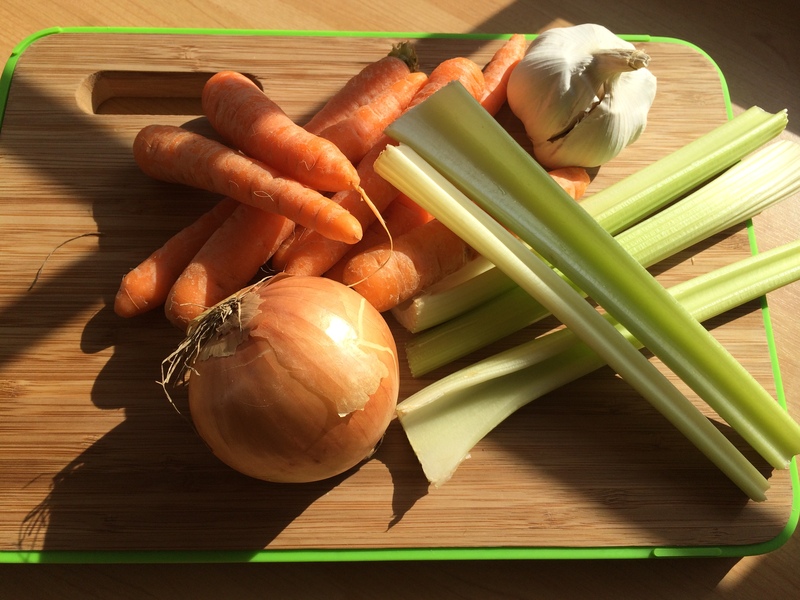 Add the “soffritto” (the onions, celery, carrots and garlic) and sweat over a medium heat until the vegetables are soft but not browned, (about 10 to 15 minutes). Add the mince and stir into the vegetables. 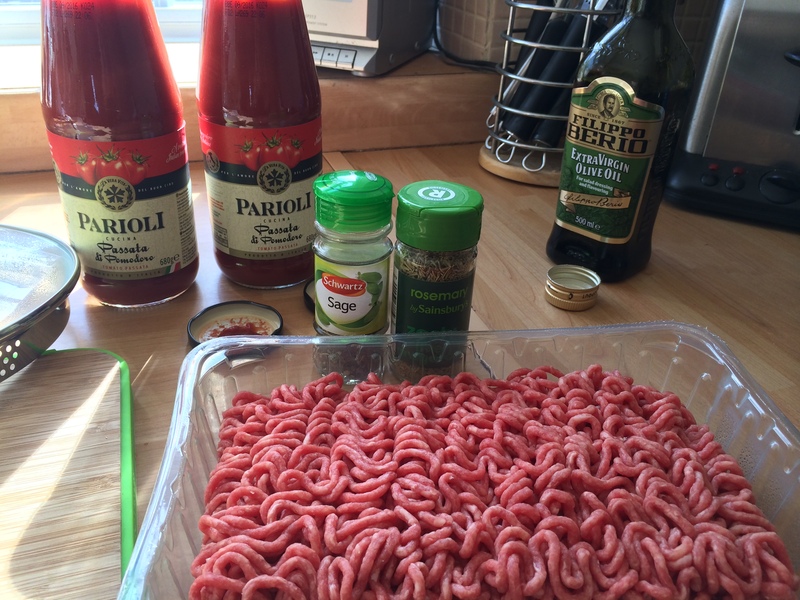 Cook the mince until it is completely cooked. 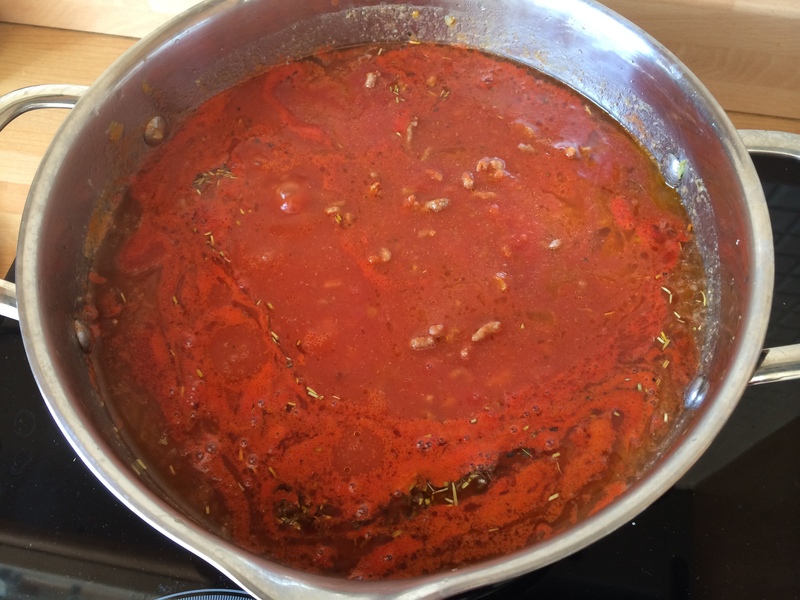 Add the tomato passata, rosemary and sage and simmer over medium-low heat for 25 /30 minutes. Season with salt and taste, remove from the heat. In a deep non stick pan heat the butter on a low/medium heat and gently melt it. Add the flour little by little keeping stirring with a wooden spoon. Once you have used all the flour start adding the milk, little by little and keep stirring. You should get a a very smooth mixture and by adding the milk the mixture will become smoother and runnier. Make sure you keep stirring it as it could easily stick to the bottom of the pan. Add the salt and the nutmeg. 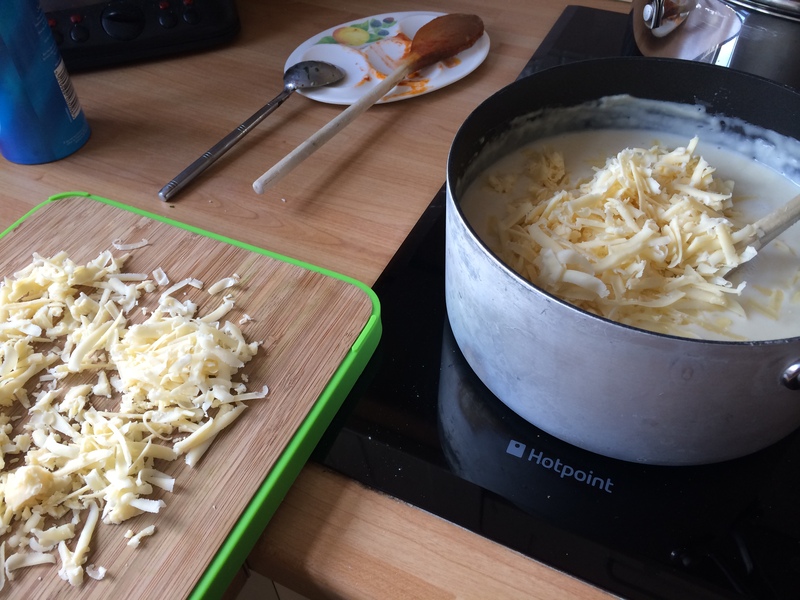 Gradually mix the cheese and stir it gently. Your besciamelle sauce is coming together! It should not be too runny or too thick! If it feels too runny, bring it to the boil and keep stirring it until it thickens up. If it’s too thick, add more milk little by little until it feels creamy and soft. I would use pre packed Lasagna sheets, unless of course I made my own one (next time I will write about making your own spinach Lasagna sheets!). 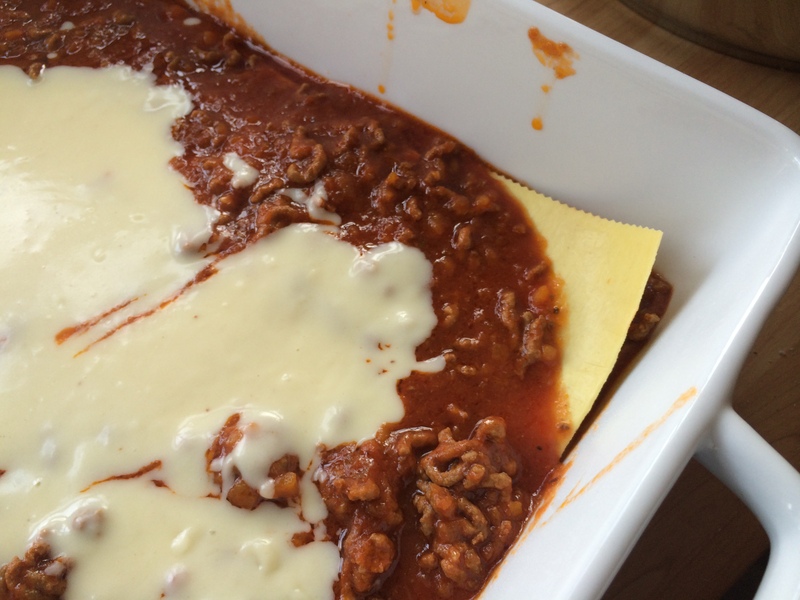 Any good quality Lasagna sheets are ok to use and you can find them in any supermarket. You will need 2/3 sheets per layer…5 layers is plenty! 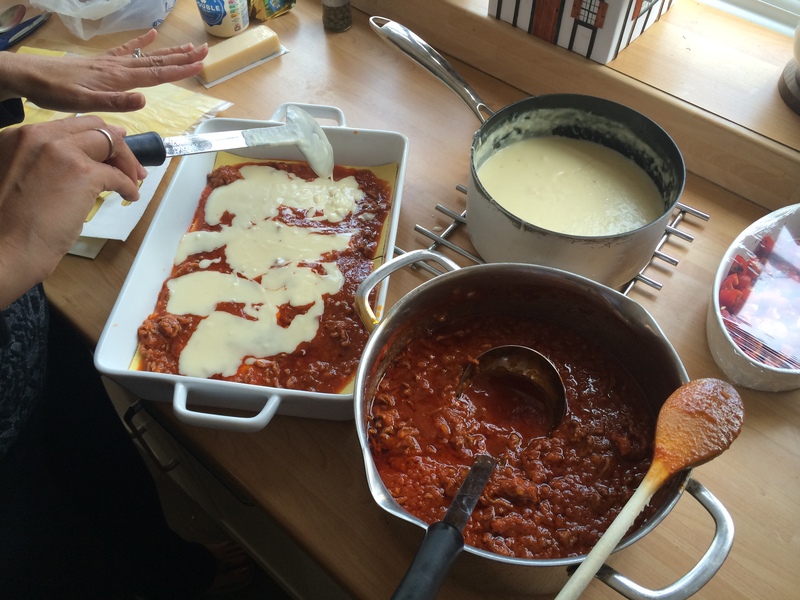 In a large tray place 2/3 sheets of lasagna (depending on the size) on the bottom and pour on some of the ragu’. 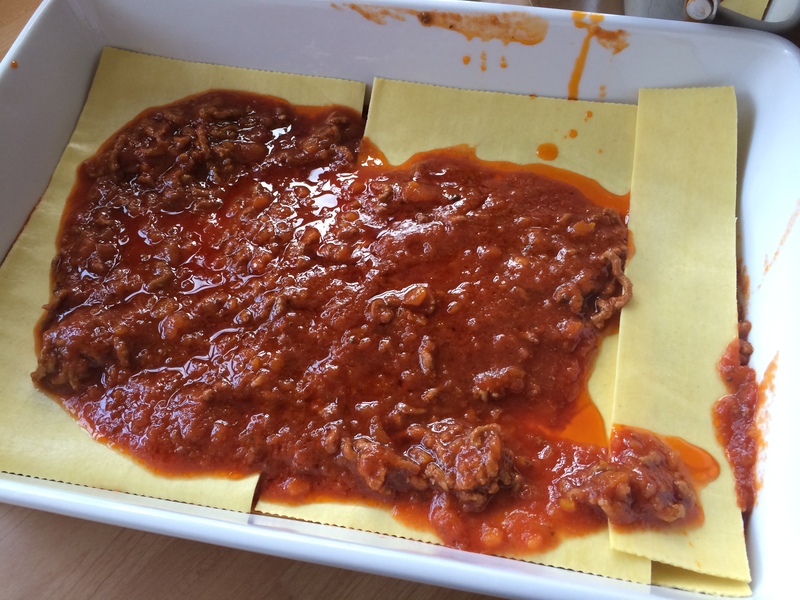 Gently pour some besciamelle sauce and with a spoon spread the sauce all over the lasagna sheets. Take another 2/3 sheets and place them on top forming another layer. Pour the ragu’ and the besciamelle on top. Repeat this 4/5 times depending on how many layers you want or until you run out of sauce! I would make a mini lasagna for my little one using a smaller dish, it tastes as good as the big one and it looks great! Kids love being spoilt and this is a great way to make them feel special at dinner time. Dust your Lasagna with some grated parmesan cheese or cheddar and place it into a preheated oven at 200 degrees (190 fan oven) for 20/22 minutes. A good test to check if the Lasagna is cooked through is to put a knife in, if it is soft all the way through your Lasagna is ready. Pronto!